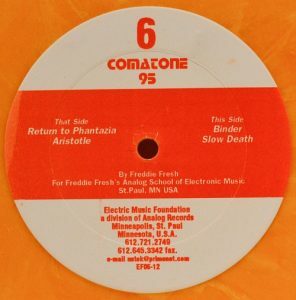 Minneapolis-born Freddie (Freddy) Fresh was in full swing throughout the 1990s and later, with a massive run of (acid) techno and electro tracks that were released under various guises on labels ranging from Harthouse to Missile. In recent times we have heard less about Fresh – a smoking collab with fellow Midwesterner Paul Birken lies more than three years back – but his extensive back catalogue offers several great finds. One of them is the mid-nineties release “Comatone 95”, which dropped on the Electric Music Foundation (EMF), an Analog Records offshoot launched by Fresh and Auto Kinetic. 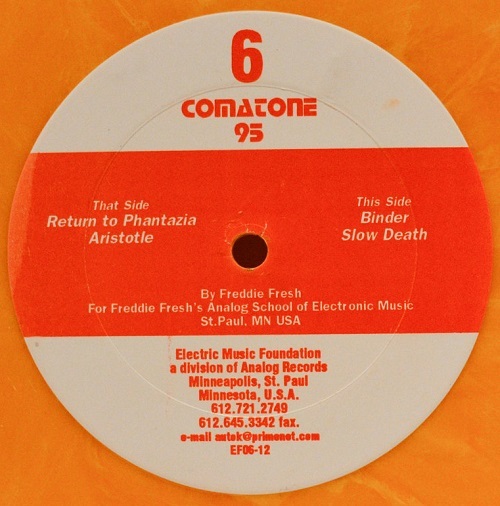 By the title, Fresh’s 1992 banger “Comatone” on EXperimental, could be related to the EMF release, but by the sound the two are very different. “Comatone 95” is about electronic music’s beautiful side, about a special breed of trance, deep and emotional. The opener “Return To Phantazia” takes us to the sweetest dreams with purring, 303-driven bass line and thereafter easy-going, Latin-smelling rhythm introduces “Aristotle”, a real mood lifter built on melodic riff, which sounds like a perfect match to Aztec Mystic’s “Jaguar”. On the B-side, atmospheric acid lines carry “Binder” and “Slow Death” goes on a metaphysical journey over the hills and far away, guided by liquid textures that are gradually covered with acidic substance. [Update 1: April 6, 2017] Discogs prices for the beautiful orange vinyl have gone up but two tracks, “Binder” and “Slow Death”, were included in “Comacid EP” on the Belgian label Forced Nostalgia. “Comatone 95’s” digital version, until recently available on the EMF Bandcamp site, has been now removed. [Update 2: May 10, 2018] “Return To Phantazia” was re-released along with remixes by the French label Toolbox Killerz.